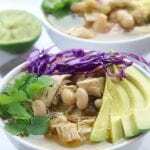 This One Pot White Bean Chicken Tomatillo Soup is a hearty and family friendly meal that can be made on the stove top or in the slow cooker. 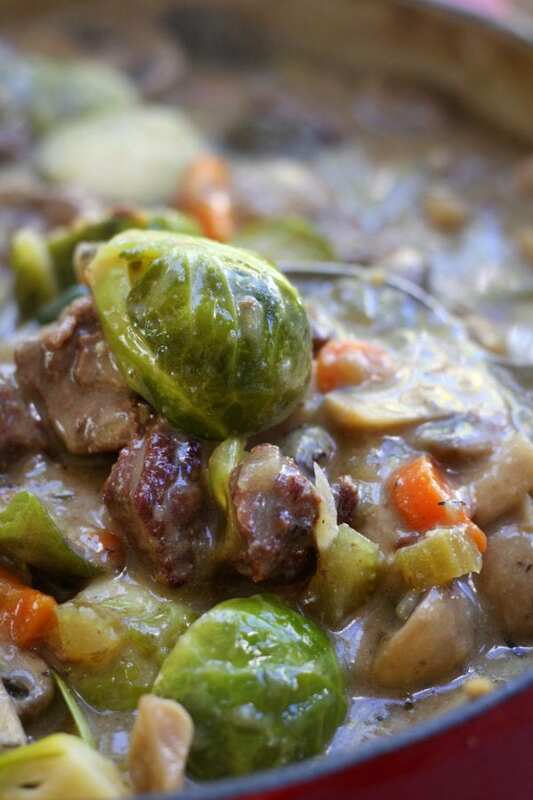 Healthy and delicious, this is an easy comfort food for anytime of year. My husband and I have a game that we play almost everyday. Well, I am dead serious every time I ask but it turns into a game. I carfluffle him out of frustration and then he hugs me, reassuring me that I am working my booty off is why the day seems to fly. I always think, “tomorrow I will get more done”. Funny thing is, tomorrow is always a repeat of the day before. Me feeling like I am chasing my tail and definitely not feeling like I get enough done. Being a business owner is a tricky thing and sometimes at the end of the day you just need a meal that feels like you are receiving a warm hug. 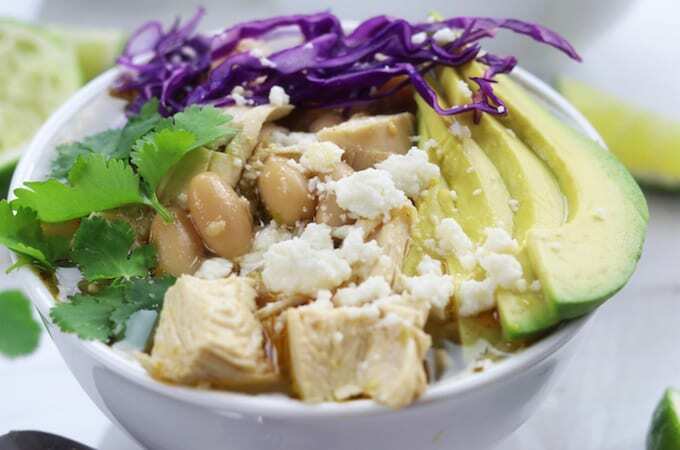 This White Chicken Chili recipe is exactly that. 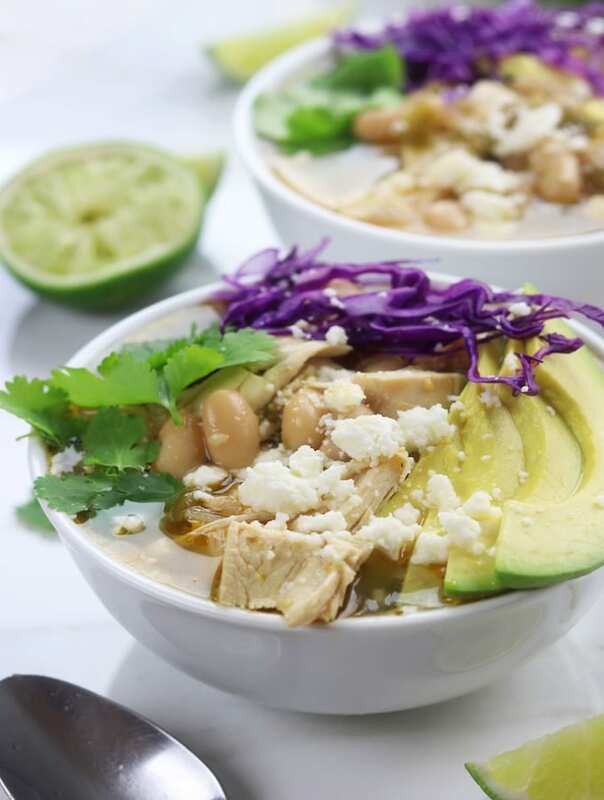 Not only is this soup wonderfully comforting but the flavor is so incredible because of this classic cooking method, tomatillos, garlic and spices. Add in the hearty beans, cheese and cabbage and oh my word!!! HEAVEN!!!! 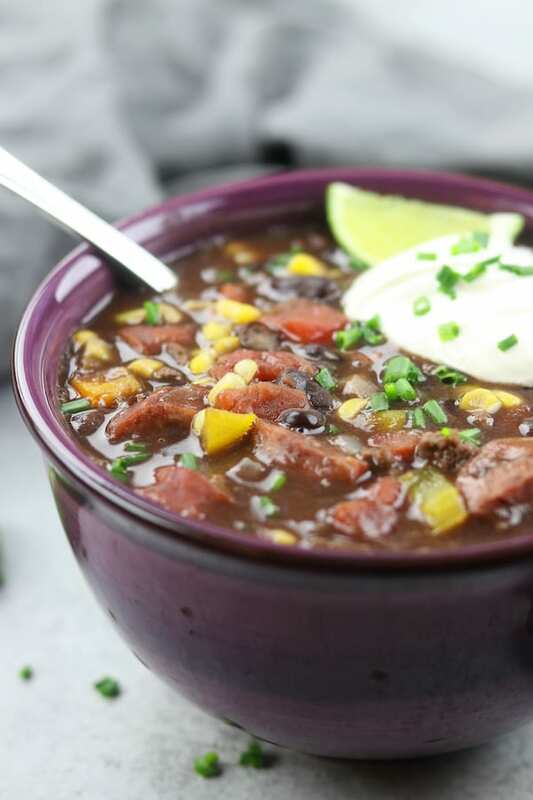 Can I make this soup/chili in the crockpot or slow cooker? Absolutely! Simply sauté onions, jalapeño and spices in oil following the first step of the recipe using a medium sized frying pan. Add whole chicken, garlic, diced tomatillos, broth and contents of the frying pan to the crockpot. Cook on low for 6-8 hours or high for 4-5 hours. 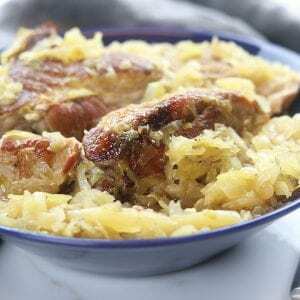 Remove chicken and debone following the same steps as recipe. While chicken is cooling add beans to crockpot and turn crockpot to high. Add deboned chicken meat to crockpot and leave on high setting for 30 mins. Salt and pepper to taste and garnish with your favorite toppings. Why use a whole chicken to make chicken soup from scratch? Here is the deal. Really good old fashioned chicken soup that is rich and full of flavor is made using a whole chicken that is slowly simmered with the aromatics. 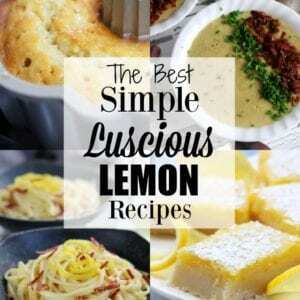 (Aromatics are usually herbs, spices, veggies, onions and garlic that gives the soup extra layers of flavor. Check out this great article for more details.) 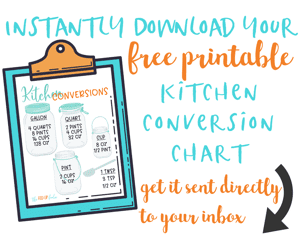 Using this cooking method does a few things. It creates ridiculously tender and juicy chicken pieces that just fall off the bone. The broth ends up being incredibly flavorful not only because of the aromatics, but also because of the chicken skin and bones. 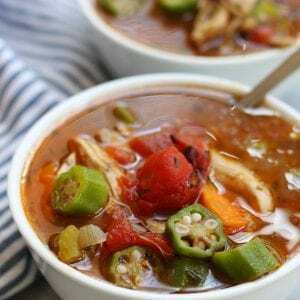 Check out my Mom’s Chicken Gumbo Soup and Homemade Chicken Noodle Soup using this wonderfully classic cooking method. If some of the chicken pieces like wings and legs fall off have no fear. Just carefully spoon them out and debone with the rest of the chicken. What are tomatillos and do I really need 2 lbs? Tomatillos are like little green Mexican tomatoes that come in a husk and have a mild lime taste. As far as the 2 lbs, YES, YES and YES. If you like salsa verde, you will be so glad that you used this amount. 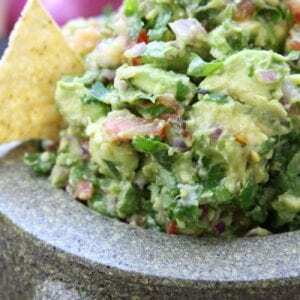 Check out my Homemade Salsa Verde recipe for more tips on tomatillos. What if I can’t find tomatillos at my grocery store? Then adding about 2 cups of your favorite salsa verde at the same time as the beans can do the trick also. 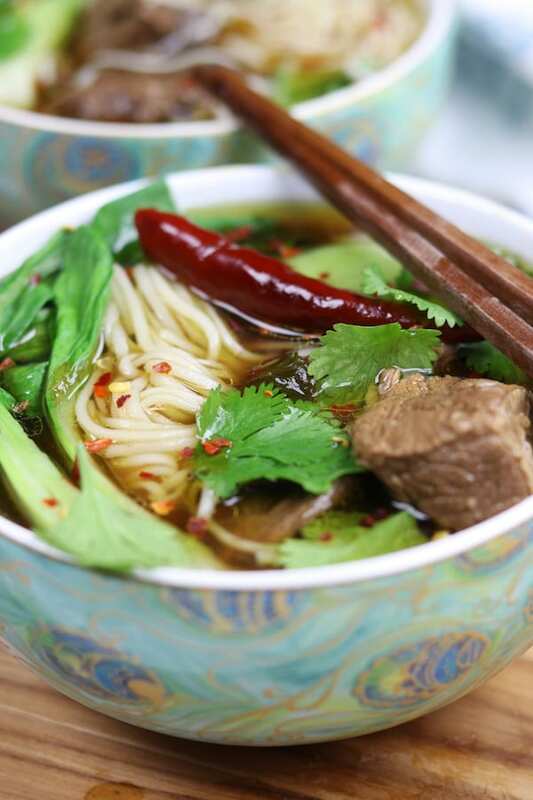 How can I make this soup more or less spicy? If you adore spicy food then you are going to want to add up to 3 jalapeños making sure to add the seeds also. If you are bothered by spicy food just stick to 1 jalapeño and absolutely make sure to remove the seeds before sautéing. 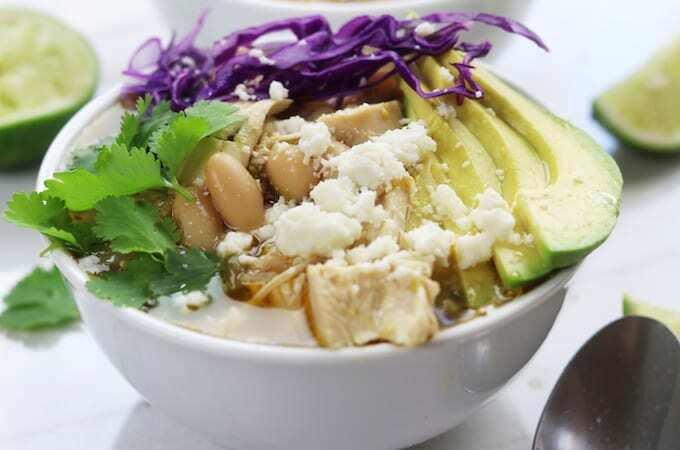 Will this White Bean Chicken Tomatillo Soup taste as good without the garnishes? Yes and no. I know, I know… that sounds like a crazy answer. Here the deal though, this soup is absolutely delicious on its own but add in those toppings and it really becomes heavenly. Because of this I recommend not skipping the garnishes. 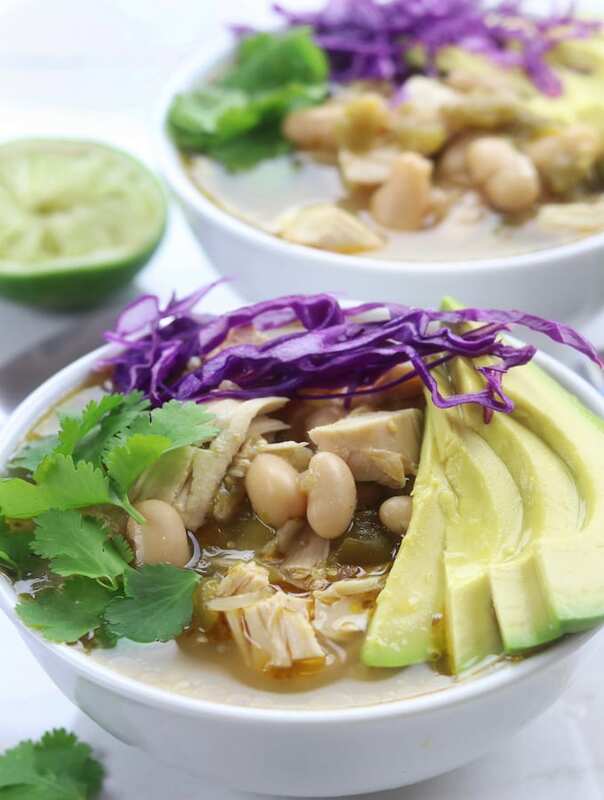 This One Pot White Bean Chicken Tomatillo Soup is a hearty and family friendly meal that can be made on the stovetop or in the slow cooker. 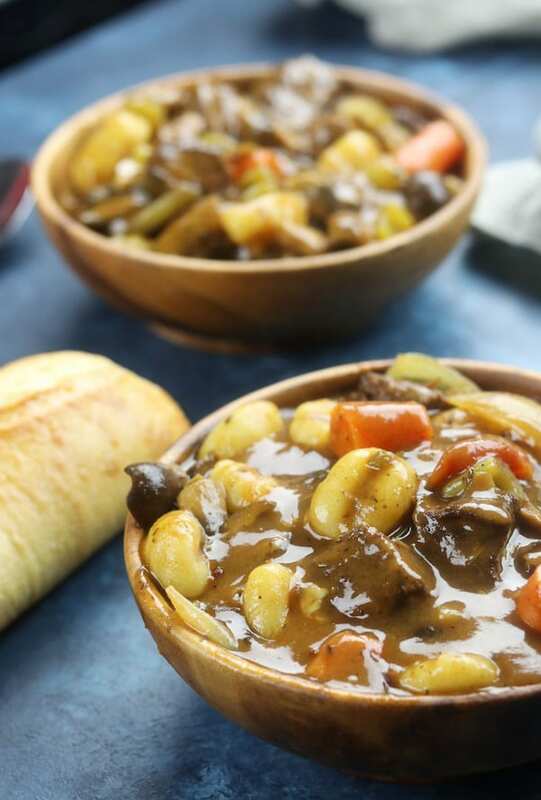 Healthy and delicious, this is an easy comfort food for anytime of year. Heat a large stock pot over med/high heat. Add oil and sauté onions until just soft and sweating. Add jalapeño and continue sautéing for another 2 mins. Add spices and sauté for 1 additional min. Turn off heat. Add whole chicken, garlic, chopped tomatillos and broth. Bring to a boil on high heat. Once boiling lower heat, cover and cook on med/low for about 1 hour or until chicken starts to fall off the bone. Once chicken is cooked turn off heat. Carefully remove chicken from broth and place on a separate plate using long handled tongs and a large spoon. Let chicken cool just long enough to handle safely with hands and then debone. Place deboned chicken meat back into broth. Open and drain beans. Add to broth. 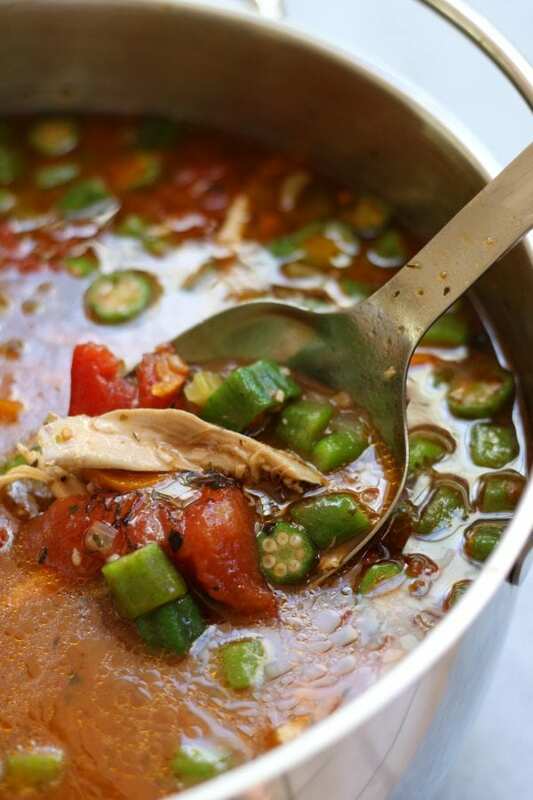 Bring soup back to a simmer over med/high heat. Once simmering serve individual bowls and salt an pepper to taste. Add your favorite garnishes.